· presenting data on pollution sources, biota, and resources in a format that is readily understandable by a decision maker, whether in the judicial, administrative or legislative context. · assisting in legal advocacy for our clients, such as public outreach and education, press releases, interviews, electronic media services such as radio pieces, press and legislative briefings. · analysis in three specific projects: Wyoming Oil and Gas Development, Total Maximum Daily Load/water quality in Wyoming and Colorado; and Environmental Justice. Data analysis and research are also becoming a larger part of our GIS program. 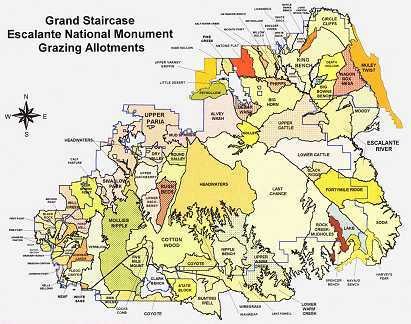 For example, we have recently used GIS to identify potential grazing and endangered species conflicts in the Grand Staircase Escalante National Monument. This was done by conducting a spatial analysis of grazing allotments, surveyed riparian areas, and known perennial streams and springs. In an example of our legal advocacy, this map will then be distributed to a number of our environmental grassroots clients to advocate for grazing management changes in the Monument. The map will also be used to convince decision-makers in the Bureau of Land Management to make more proactive grazing management changes before the impact to endangered species increases. Our legal advocacy with our clients has also enabled us to create some productive partnerships with other organizations with our system. For example, in the spring of 1999, we represented Forest Guardians of Santa Fe, New Mexico, in a landmark grazing and endangered species suit. Forest Guardians had created an extensive GIS analysis of the different allotments and their impacts on endangered species. We were able to exchange information with Forest Guardians to duplicate maps and perform some of our own analysis. The use of these maps as a tool to rally public support and as exhibits in the courtroom was critical in the eventual success of our case. These are only a few of the examples we have used GIS to assist in all aspects of our work. However, one of the challenging facets of utilizing GIS in our office, are the unique and changing needs of an environmental law firm - dynamics of cases can change, leading to different priorities and tasks. For example, our Wyoming Oil and Gas and Environmental Justice efforts never panned out, while our Colorado water quality/TDML case has turned into a longer term project. Nonetheless, as shown in our examples, we have been able to adapt our GIS system to immediate needs and cases. Another challenging aspect for our program has been the ability to obtain useful data or data compatible with the limitations of ArcView 3.0a. We often have to rely on good faith efforts from public agencies or other environmental groups to find the data we need. The result is that desired projects are often shelved or greatly reduced because of the time commitments of finding data, the general lack of data, or our systems incompatibilities. To alleviate our data problems, we are planning on applying for a software upgrade from ESRI for a Data Automation Kit (DAK) as well as an upgrade to ArcView 3.1. This will allow us to convert a larger array of GIS data, as well as take advantage of some of the time saving features of 3.1. We also plan on applying for another CTSP grant during the next cycle for a large plotter. The plotter will allow us to showcase some of our projects in a larger format as exhibits for in court arguments and for public education efforts. Other challenges have been balancing the time of legal research and GIS projects. GIS assignments tend to be time intensive and lengthy, especially considering our data limitations. Hopefully, after we obtain a DAK, we can create more of a GIS database, which will cut back on lengthy data acquisition efforts. While we certainly have faced hurdles in implementing our GIS program, we are fully committed and excited about the opportunities our GIS systems presents for us. After a full year of utilizing our GIS system, it is becoming as seamless a part of our organization as filing discovery motions and notices of intent to sue. The CTSP grant has had a tremendous impact on the Rocky Mountain Office of Earthjustice Legal Defense Fund. Our GIS system has enhanced our legal efforts to the point where we feel we have distinct advantages over many of our opposing counsels. For each case, we try and brainstorm on what kind of exhibits or graphical analysis would help further our arguments. Moreover, our GIS system has enabled us to enhance the work of many of our grass roots environmental clients who do not have access or time to develop a GIS system. We have also found our GIS system to be very important in working with not only other non-profit groups, but with federal and state agencies. As these public agencies increase their use of GIS for management decisions, we find our GIS system vital in communicating with these agencies. The CTSP program has acted as an equalizing factor, insuring that environmentalists have the same technological tools as decision making public agencies. This has enabled us to react faster to public agency decisions, and through cooperation with other environmental GIS programs, sometimes even beat the agencies to the punch. For example, recently great strides were made in resolving road access differences in the Grand Staircase Escalante National Monument. 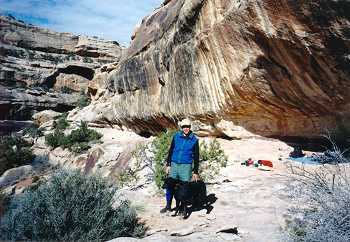 For years counties had claimed historical access routes across public lands to keep areas from being designated as wilderness. The Monument straddles two counties, but only one county had settled their claims while the other was still negotiating. 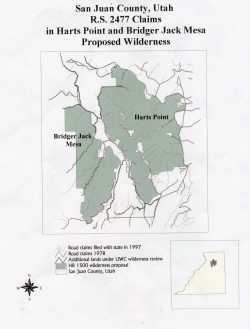 To work out differences, we traded spatial information with the BLM. We compared their road inventory data in the Monument with our own road data and proposed wilderness areas. We quickly analyzed their data and produced maps of our specific areas of concern for the negotiations. Our analysis of the BLM maps revealed we had better data then the BLM was using. More importantly, many differences were easily corrected mapping errors. While the negotiations continue, our ability to obtain and forcefully challenge the BLM data will be helpful in advocating for more restrictive management of those areas. Other benefits of our CTSP grant has been the ability of our GIS staff person to obtain continual training and guidance on our system through ESRI. This has increased staff knowledge of our system as well as allowed us to fully utilize many of the helpful features in ArcView 3.0a and its extensions. We foresee the continued use and expansion of our GIS system for our legal, policy, legislative, and educational efforts. We are currently planning a series of statewide meetings on water quality problems in Colorado. We plan on producing maps of the state and watersheds comparing polluted streams and rivers to the inadequate clean up response of public agencies. We hope these maps will encourage citizens to take a greater interest in their local watersheds as well as enlighten them to the poor response our public agencies have taken in addressing water quality problems.